DEWE (Differential Expression Workflow Executor) is an open-source software to perform genetic differential expression analysis of RNA-Seq data. 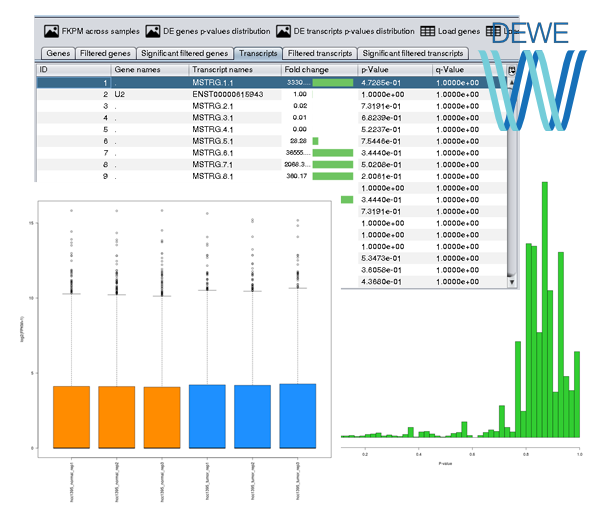 DEWE offers built-in, easy-to-configure workflows that facilitate the execution of DE analyses. Currently, DEWE provides two differential expression analysis workflows: HISAT2, StringTie and Ballgown and Bowtie2, StringTie and R libraries (Ballgown and edgeR). A key feature of DEWE is the interactive results management and visualisation. The main results of the execution of a built-in workflow are the outputs provided by Ballgown or edgeR. These outputs are automatically visualised in DEWE after the workflow execution and they can be reopened at any later time.